Hit by the credit crunch, Dubai's economy has taken a turn for the worse reliant as it is on tourism, financial services and real estate. For those labouring to make the Dubai dream a reality, building the homes for the rich and famous, are facing greater pressures than ever. But despite the slump, the market in would-be buyers is still healthy as Panorama's Ben Anderson discovered. Posing as a potential buyer and kitted out with a secret camera, he met with a company endorsed by celebrities. Michael Owen is a paid ambassador along with Freddie Flintoff and golfer Sam Torrance. Sales representatives from The First Group assured our reporter that now was a great time to buy property. She also allayed any concerns about the wellbeing of the company's construction workers. Offering a purchase that would see a £438,000 apartment rise to £1.33 million in just ten years, the sales reps also said they believed the workers were happy to be there. "It's much more difficult to earn some money in Pakistan or India, so people actually save by living for free in proper housing, eating for free in the canteen, using the transport and sending something to their families." It is the promise of a land of opportunity that has brought an estimated one million migrant workers to Dubai. Most come from areas of extreme poverty in the Indian sub-continent where they are easy prey for recruitment agents. Paying up to £2,000 pounds to make the trip, the sum often has to be borrowed or family land sold in the belief that within 18 months the debt can be repaid. Instead, on arriving in Dubai they are met with shanty town conditions hidden from public view. In a country that penalises journalists reporting stories which negatively reflect the economy or insult the government with massive fines and in the past even imprisonment, Panorama had to maintain a low profile. In secret, Ben Anderson followed a group of workers home from work. Employed by The First Group's sub-contractors United Engineering Construction, they were working on a development due to be finished in June ready for Michael Owen to move in. Back at the worker's camp Ben was soon rumbled and asked to leave. Returning over the next few days he finally managed to speak to some of the men living there on condition of anonymity. They told a grim tale. None had been paid the money they were promised by the recruitment agencies and many said they could not afford to eat properly, living on a diet of mashed potatoes and lentils. Average salaries are often no more than £120 a month. This for a six-day week, often working up to 12 hour shifts. One company paid approximately 30 pence an hour for overtime. UNEC said that its minimum basic salary and overtime rate were significantly higher and that employees only worked 12 hour days in exceptional circumstances. It said its workers were fully aware of their proposed terms of employment before travelling to Dubai and that it "wholly disapproved" of workers paying recruitment agents. It also said that it only recruited through one agency in India, but the workers we spoke to came from elsewhere. The camp is a world away from the penthouses these construction workers were building. But this is not an isolated example. One of Dubai's biggest new developments is The Jumeirah Golf Estates, which will host the climax of the European Golf championship in November. The main developer is Leisurecorp, which also owns the championship golf course at Turnberry in Scotland, and has a stake in Troon. Jumeirah Golf Estates has attracted an incredible array of celebrities who are named as ambassadors on its website , including Jamie Oliver, Greg Norman, Vijay Singh and Sergio Garcia. Our reporter once again followed workers back to their accommodation. This time they were employed by one of Dubai's biggest construction firms Arabtec to work on a part of the development that had been sold to a sub-developer, but the picture was familiar. After an hour-long journey back to their gated and guarded labour camp, the men agreed to speak to Panorama if their identities were kept secret for fear of retribution. Armed with a secret camera Ben sneaked into the camp to be met with the smell of raw sewage. Sewage had leaked out all over the camp, and workers had to create a network stepping stones to cross it and get back to their accommodation blocks. One toilet block had no water supply and the latrines were filled with piles of raw faeces. Documents obtained by Panorama showed that a month previous to the programme's visit, the Dubai authorities described the sewage situation at the site critical. 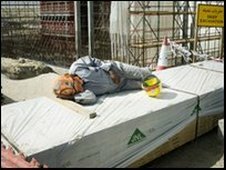 Arabtec had been fined 10,000 dirhams, approximately £2,000, for allowing sewage to overflow into workers' accommodation. But with the downturn in the economy, the workers feel less able to complain. One Arabtec worker who earns just £140 a month for a six day week, told our reporter that his family at home don't know about the reality of his situation. "We have not told them because if we do, our wives and our children will start crying, so we have told them we are doing well". 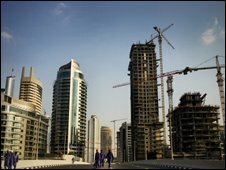 The Dubai Municipal government said in a statement that regular inspections are carried out of migrant workers' living conditions and fines levied for substandard housing. Arabtec said it did not accept that there were unsanitary conditions at any of its camps' toilets. It blamed the workers, saying, despite training, their "standards of cleanliness and hygiene are not up to your or our standards" and that the toilet block we had filmed in may have been a block that was meant to be closed. In a statement to Panorama, Jamie Oliver Enterprises said they were disturbed by the issues raised: "When we started work with our partner in Dubai, we were informed of their strict contractual guidelines which are in place with sub-developers to protect the rights of migrant workers and provide for good living and working conditions. "While we are satisfied that the sub-contractors employed directly by our partner to work on Jamie Oliver projects meet the regulatory requirements and are fair, we have been given further assurances that the claims made by employees working on a sub-developer's project will be investigated." In the meantime, the celebrity chef's name has been removed from the list of ambassadors on the company's website. Panorama: Slumdogs and Millionaires is on BBC One, Monday 6 April at 8.30pm. In video: Can Money Grow on Trees?